We love having sheep on the farm. Our 12 year old raises them, but we all love them. 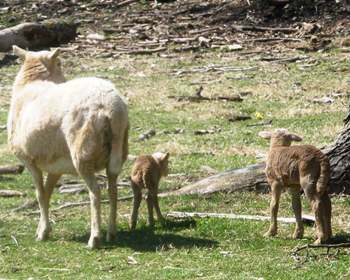 It has been lambing season here on Vaughnshire farm. We love having babies around here! We’ve had mostly pleasant experiences this year, except for the one stillborn lamb the boys had to pull. 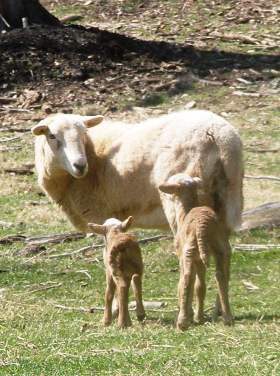 That momma ewe is doing wonderfully though. We weren’t sure if we would lose her or not. The other ewes have done wonderfully. They’ve all given birth to twins and have been excellent mothers. Yesterday, one of our younger boys ran in to tell the family that one of the sheep had a baby…just one. We all went out to take a look and by the time we arrived…there were two babies! That was very exciting. These two babies were very unique. The ram lamb was huge. The ewe lamb was a tiny thing. Normally the rams are a tad bit bigger, but the twins are usually pretty close to the same size. These twins are different! We’ve never had this big of a difference in size. They are both doing great though. Tomorrow, the young shepherd is going to try to catch the babies to measure and weigh them. Thank you for all of your info! Our primary goal is to have a milking goat. Fortunately the area we live is almost always dry, so we’ve got that going for us! I will check out the link you gave. Thanks! Goats will do much better in a dry area! We live in a rainy area which we love —great for growing a garden….but it’s hard to keep goats. We have several different fenced areas (a 1 acre paddock, 1/2 acre paddock….and one 5 acre but other unfenced land we use for the cows and sheep to browse and forage on) We rotate the cows, sheep and goats. We use some of our more wooded land that is not fenced and let the cows and sheep eat that because they are more trustworthy when you go to round them up. We are looking to put up some more fencing so that we can use more of our land. It is mostly wooded land that is not fenced. We have 14 sheep as of today…we have one more ewe expecting within a few days/weeks. Do you mind me asking how many acres you have and how many sheep/goats you have on your property? We have only one acre and are considering getting two goats. We are curious how much extra feed we will need to supply in addition to letting the free-range on our little pasture. Thanks in advance! Your family has really been an inspiration to me, by the way. 🙂 I’ve been perusing your site for a year or so now. It is going to depend on what you are wanting to use your goats for: brush/grass eaters or milk goats or meat goats? Here’s an article for you to read. It talks about raising meat goats, but we’ve found the issues discussed in the article to be very true with brush and milk goats. Goats will do a decent job of keeping an acre of pasture land eaten down. They do better if you can rotate them in different areas because of their susceptibility to parasites. Contrary to popular opinion…goats do not eat everything. We’ve found goats to be very picky eaters. Goats are dry weather animals. They must have dry shelter and be kept out of the rain or they will easily get sick and die. We keep our goats on grass most of the year..however this winter being exceptionally cold and long, we did have to supplement their diet with hay and feed. They love feed…and will prefer it to anything. However, we try to avoid this because they are bottomless pits and the feed is expensive. A brush goat should be able to live on brush and grass without feed. A milk goat will need feed at milking time. We’ve downsized our goat herd to 3 goats….and probably will downsize even more. Sheep are much easier and cheaper to raise and you can turn it into freezer meat.